The people of Newfoundland and Labrador revive an eccentric tradition that’s part Christmas, part Halloween, to celebrate the holidays. The first thing I noticed when nearly 300 of us gathered in an elementary school gymnasium to “rig up”—that is, disguise ourselves—en masse was the racket. The noise was more arresting than the people wearing multiple shirts and pants, their bodies padded with pillows and faces shrouded by lace curtains, lampshades, or pillowcases with two holes cut for their eyes. It was more demanding than the men (or were they women?) flaunting oversized brassieres stuffed and stretched tight across their rain slickers. The wheezy chorus of accordions, punctuated by erratic foot-stomping and accompanied by the metallic jingle of a dozen ugly sticks—an instrument that’s a cross between a tambourine and a walking cane—upstaged even the hulking life-size hobbyhorses with puppeteers hiding beneath their burlap “manes.” We were packed into that surreal pressure cooker on an overcast December 2009 afternoon, waiting to debut our costumed selves, with no script and no concrete directives other than to move forward, on the streets of St. John’s, Newfoundland and Labrador, for the inaugural Mummers Festival Parade. Festival director Ryan Davis was somewhere in the swarm of mummers, his face masked under a sheer veil, fastened in place with a baby-blue cap. His pillow-pregnant belly was stuffed under a hot-pink dress (with shoulder pads), his arms were enveloped in pale stockings, and he wore blue wool gloves. His mind racing, Davis, who’d studied festival culture but was taking his first turn as an administrator, was both mystified and thrilled by the turnout. 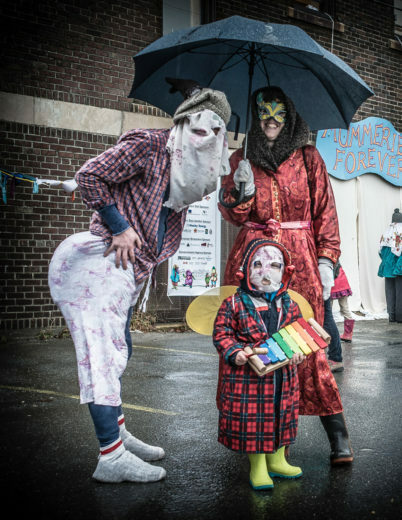 Mummering has become a powerful symbol of identity here in Canada’s most easterly province, so it’s no wonder “a mob of mummers” pitched up to march through the capital city, undeterred by a halo of rain, drizzle, and fog—courtesy of the island’s position in the North Atlantic. The original parade was axed when mummering was banned in Newfoundland and Labrador 150 years ago, back when social unrest was high and the disguises enabled violence and public nuisance. At the time of the 2009 festival, I’d lived in the province for three years, there as a graduate student in Memorial University of Newfoundland’s folklore department. I’d studied these disguised Christmastime merrymakers in their various contexts, but the parade was my first attempt at being one. The St. John’s Mummers Festival, now in its eighth year, is the latest installment in a decades-long effort to revive what most see as a homegrown cultural practice. Mummering typically takes place on a smaller scale in the form of house visits. Over the 12 days of Christmas—from St. Stephen’s Day on December 26 to Old Christmas Day on January 6 (also known as the 12th day of Christmas or Epiphany)—adults gather in small groups, disguise their identities with whatever clothing and household items they find on hand, and then call on their neighbors. The tradition, rooted in England and Ireland, evolved in the New World in the 1700s as higher numbers of seasonal fisher families settled in the small communities scattered across Newfoundland and Labrador. The present family-friendly parade is a far cry from the 19th-century version. It’s also a departure from contemporary mummering, which is community driven, spontaneous, and mostly rural. But for urban residents, who often have transient neighbors and few family members or religious ties, communal gatherings can be precious and rare. The festival anchors participants to their past, but perhaps more importantly, it tethers them to each other. The fact that people show up, year after year, is in itself a phenomenon. And the numbers keep growing. While forms of mummering linger in Europe, there are only a handful of North American examples. There’s the Germanic tradition of belsnickling in Nova Scotia and several US states, including Pennsylvania, Virginia, and West Virginia, which is nearly identical to a mummer’s house visit. And there’s the Philadelphia Mummers Parade, a Mardi Gras-esque folk festival that is currently entering its 117th year. And in Labrador’s Inuit culture, disguised spirits called Nalajuks emerge from their homes in the eastern sea ice to visit children on the 12th day of Christmas. Mummering, which can also be called janneying, mumming, or guising, varies across Newfoundland and Labrador in form and persistence. But generally it goes like this: after mummers knock on someone’s door, the host invites them in. It would be unneighborly to say no, and some think it would be bad luck to turn mummers away. Once inside, it’s the host’s job to guess the mummers’ identities, which is a feat since they’ve also taken pains to mask their voices, their gaits, and even their genders. When the mummers are revealed, they pull up their masks and are offered a cordial-like drink called syrup, although they often prefer something stronger. The mummers might perform a song, or a dance, or play a tune using instruments they’ve carried with them, but soon they disappear back into the wintry night from where they came, heading to the next house where they’ll do it all over again. Historically, in St. John’s and neighboring urban centers, mummering had an undercurrent of sectarian violence and political unrest that eventually led to the ban, which was lifted in the mid-1980s. The original mummers parade was often rowdy, dangerous, and highly alcoholic. Hobbyhorses, with their menacing jaws and rusty nail “teeth,” were used as weapons—several violent crimes in the mid-19th century and at least one murder were attributed to mummering-related activity on the island. Recently, I spoke with Brookes on the balcony of his home in The Battery, a fishing village that clings to the rocks opposite the St. John’s harbor. Brookes is tall and thin with an unmistakable string-bean-like frame that’s difficult to disguise when mummering. It’s something he does intermittently now, but did ritually in the 1970s, when the counterculture revolution was still fresh, upending the social order of the day was de rigueur, and authenticity was rediscovered in old traditions. The Mummers Troupe cruised the city for signs of holiday house parties—lit windows, lots of cars outside—and then knocked on their targeted doors. 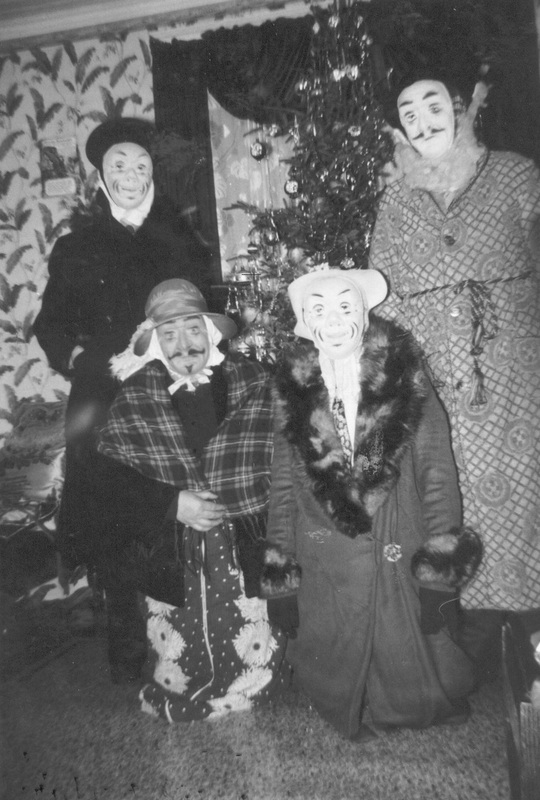 Most of the time, despite the fact that mummering was still illegal, the troupe members were invited inside where they’d perform a mummers’ play that they’d learned from interviewing elderly people on the island’s Southern Shore. It’s a folk drama with several variants that feature duels, heroes in combat, romance, death, and resurrection, hinting at pre-Christian ideas of solstice and renewal. As per tradition, you couldn’t attend these performances—the performance had to come to you. Much like the world Dickens captured in his prose, Newfoundland and Labrador was a British colony rife for many years with miserable poverty, social injustice, sectarian conflict, and a system rigged in favor of the wealthy ruling class. It’s worth noting that some scholars caution against these sweeping generalizations of class-related mummering violence—19th-century trial documents reference alcohol and interpersonal conflict, but not ethnicity or pecking order. The research isn’t conclusive, nor do court records necessarily reflect the nuances of an era, but it wouldn’t be the first time a privileged view has filtered history. In today’s digital culture, mummering stands apart: there’s little planning involved, it happens face to (veiled) face, it’s unscripted and entirely spontaneous. A friend who was married on December 28, 2005, had mummers show up at her wedding. “They were family friends but weren’t official guests,” she says. They were one of her best memories from that day. It’s the kind of surprise performance that many event organizers could only wish for. Davis says he often gets calls from groups asking for mummers to perform at gatherings like hockey games, conferences, and office parties, but he never obliges. “There’s a line between acceptable and appropriation,” he says. When mummers perform for a crowd they don’t enact the entire ritual: they remain a stranger, disguised, and there’s no guessing game involved. Out of context, play-acting mummers can appear bizarre, goofy, and antisocial. Davis might be leery of capitalizing on mummers, but for others they’re big business. Put a mummer on it and you can sell it, at least that’s how it seems in the tourist shops that line Water and Duckworth Streets in St. John’s where they sell mummer-themed wineglass charms, tree ornaments, cheese knives, and snow globes; singing mummer figurines; and mummers on magnets, postcards, placemats, T-shirts, paintings, and even painted rocks. One souvenir shop I stopped into had four shelves crammed with mummer paraphernalia. I asked who buys the mummering stuff, which is a mix of work by local artisans and mass-produced inventory. This production of Simani’s “The Mummers Song” (or “Any Mummers Allowed In?”) was broadcast by the Canadian Broadcasting Corporation in 1986. Brown’s mummering days are behind him. His last house visit was in 1953 (the night his daughter was born). Tonight, I’m visiting Brown in the cove and we’re sitting in the living room of his childhood home, which his father built. We met six years ago when I rented the house next door. He was in his mid-80s then, and over a few months, I marveled as he demolished a two-story home by hand as a favor to the cousin who owned the structure. Outside, a red-pink light streaks the sky, illuminating a scattering of century-old fishing homes along a steep hill. Below is a small natural inlet, called Blackhead Bay, that leads out into the larger Bonavista Bay. In the past it was a hive of activity, as fishermen left and returned, hauling in catches of cod and salmon, the resources that drew Brown’s ancestors here from the British Isles, their traditions, like mummering, in tow. When there were 45 houses here, rather than a scant two dozen, disguised visitors were common over the 12 days of Christmas. “The house would be half full some days with mummers,” Brown says. “It was the only form of entertainment.” But then, says Brown, came radio, and television, and other modern distractions. People moved away as the fish grew scarce and employment scarcer. The small outport communities emptied. “There’s nowhere to [visit] now,” Brown says. Mummering as he knew it was disarray and disorder. “Let me lead you through it,” he says. Brown bends forward to alter his height, changes his gait, and drags his leg. He disguises his voice by drawing in a sharp breath and speaking at the same time. Then, he abruptly switches roles. He is the host, offering food and drink and trying to draw out his visitor’s identity by asking questions. It’s a convincing demonstration. It doesn’t matter that it’s early July, roadsides sprouting lupines rather than piled high with snow, because the social landscape that Brown describes no longer exists. He’s imagining winter, but he’s conjuring the past. For many, Brown among them, mummering is laced with nostalgia for a time that was harsher in some ways but also simpler to navigate. The working class fished, for the most part, forever in debt to the “fishocracy” of wealthy merchants: very Dickensian. But like many places, Newfoundland and Labrador has had to roll through a century of change that upended the social order. Joining confederation with Canada in 1949, outmigration, extreme poverty, overfishing by European trawlers that destroyed the inshore fishery, and, the final indignity, a moratorium on cod fishing in the mid-1990s—these were all threats to Newfoundland and Labrador’s identity and culture, but they also fueled what some academics termed a nativist pride. Within this, buoyed by scholarly work, a pop song, and political theater, mummering came to symbolize not just the province’s past, but also its present. To achieve this, community relations need to be strong. Mummers act like strangers, but the irony is that, besides the recent mummering festivals, an outsider—a real stranger—couldn’t take part in the door-to-door custom. The host needs to be familiar with the person under the disguise in order for the give and take of this folk drama to succeed. It’s easy to be drawn to the culture of Newfoundland and Labrador, enchanted by the tales, beliefs, and ceremonies of the people. The Mummers Parade allowed me to partake—at least in some form—in a ritual that I’d come to know intimately but never enacted. I suspect it provides a similar opportunity for Newfoundlanders without ties to this custom, connected to it by virtue of their birth, but not by memory. People like Davis, who grew up in a suburb of St. John’s where mummering wasn’t practiced, still buy into the tradition as a regional identity. “Townies haven’t necessarily experienced mummering, just as people from away are new to this ritual,” Davis says. “It allows them to engage in Newfoundland culture in a mediated form.” He says that this extends to expatriates, and that many people who return to the province to visit family over the Christmas holiday take part in the parade. Inclusion might be the most valuable asset of organized folklife festivals, and this transcends whatever criticism has been lobbed at the Mummers Festival. Eight years in, it’s safe to say that the event is a success. What’s less clear is if it will propel a revival of the house-visiting custom, or achieve the greater goal of advancing public consciousness of the tradition. This is difficult, maybe impossible, to quantify. It is a question for the future. In its current form, the festival is a kind of hybrid of past and present: it’s alive, it has momentum, it’s practiced by many who feel connected to the act and each other, and this, in some ways, is the definition of ritual. A custom’s original meaning often gets lost in the fray, but I’m not sure this matters. Like non-denominational Christmas celebrations, the Mummers Festival may not be authentic, but it’s no less meaningful or important for the people engaging in its festivities, nor, for that matter, less fun. Looking back at a photo of myself dressed as a mummer in 2009, I can see some glaring errors—my hands are exposed and I can see my great-grandmother’s wedding ring on my right index finger, the ring I wear every day. Also, you can see my hair. The worst? I’m wearing a sweatshirt advertising a folk festival I’d worked for that previous summer. Rookie, I think to myself now. Total mummering rookie. When the first-ever modern parade reached its destination—The Rooms, a provincial archive, art gallery, and museum—mummers began to lift their false faces. The provincial folklorist crawled out from under a hobbyhorse; Davis shed his pregnant woman guise; and I started to recognize people from my downtown neighborhood and from my program at the university. I have to confess, all these years later, that I never lifted my doily. I stretched my anonymity as long as I could because, underneath my disguise, shabby as it was, I could pass—as authentic, as local, as someone who belonged. Emily Urquhart is a national-magazine-award-winning writer and has a PhD in folklore from Memorial University of Newfoundland. She is the author of Beyond the Pale: Folklore, Family and the Mystery of our Hidden Genes (2015). Her articles have appeared in Azure, Flare, and The Walrus. 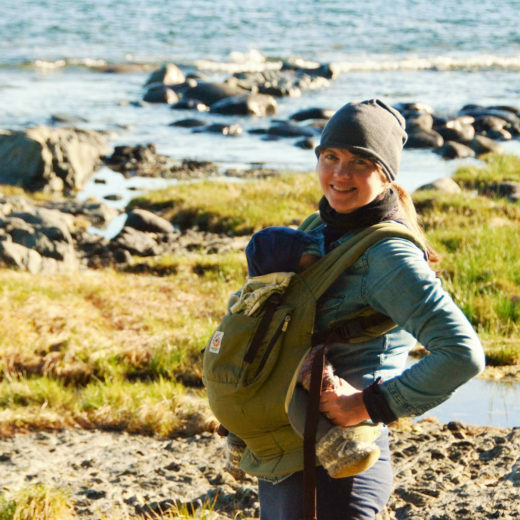 She lives in Victoria, British Columbia, with her husband and their two children, who were born on opposite coasts of Canada. Cite this Article: Emily Urquhart “Return of the Mummers,” Hakai Magazine, Dec 6, 2016, accessed April 26th, 2019, https://www.hakaimagazine.com/features/return-mummers/.